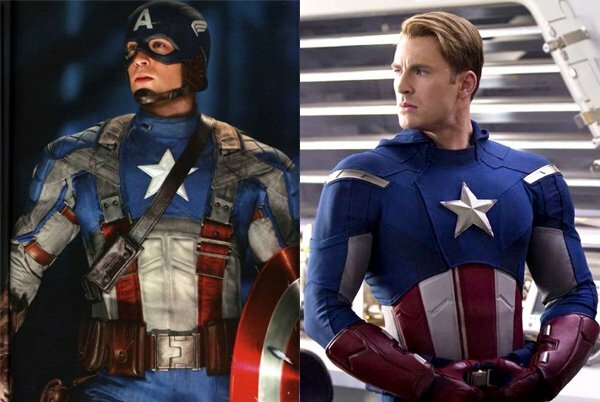 Captain America, played by Chris Evans, already got his own character poster back when the string of Captain America:The Winter Soldier character posters first launched, but who are we to argue against the film's titular hero? This new one-sheet comes courtesy of IMPAwards, where you can see it in its highest resolution. "You’ll see when you see the movie what he’s doing and who he’s working for in the beginning of the film, that costume is appropriate for what they’re asking him to do. It is a stealth outfit. It is for secret missions and I think that it’s thematic. You read online, people get rankled when you mess with the stars and the stripes, but there’s a very specific reason we did it in this film. We won’t talk about the other outfits that appear in the movie, which you’ll see in the movie, but again, I’ll just say, that the use of the costume in this film has a very thematic arc to it and hopefully a very rousing arc. The fact that Cap battling against Winter Soldier (a.k.a. Bucky Barnes), a ghost from his past, it makes perfect sense that the film would try to find a way to get him back in his old World War II outfit - which I guess wasn't too badly damaged while he was frozen in ice for more than half a century. Still, I can't wait to see the whole thing play out on the big screen, which we'll be able to do when the film hits theaters Stateside in one month and one day on April 4, 2014.